The webinar will present an introduction to the studies that will be performed during the planning phase of an HVDC system. Planning studies are usually required to determine the location of the converter stations, ac voltages of the connecting substations, power rating and voltage rating, overload requirements, reactive power requirements, performance requirements, operating modes and configuration of the HVDC system. 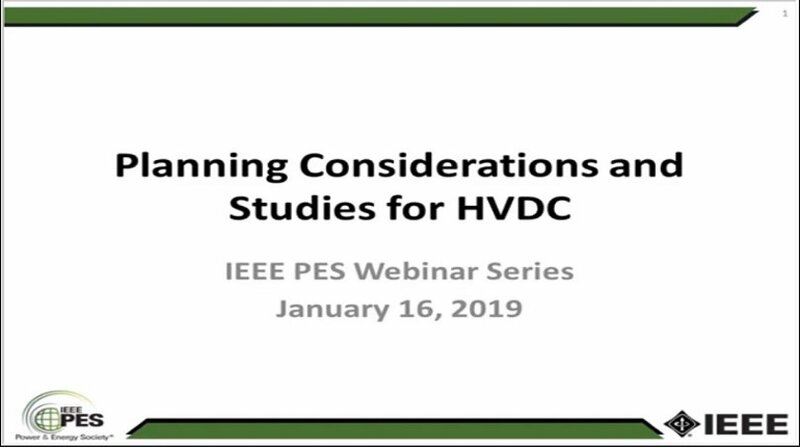 The webinar discusses the process, criteria and studies to be considered during the planning stage for developing a proper specification and successfully integrating the HVDC scheme into the electrical network. Attendees will understand the reasons for performing studies, a planning engineer�s perspective of the technical issues that must be considered, criteria that must be followed during planning phase, applications to be considered, technology aspects, reliability indices, control strategies, simulation tools for planning studies and lessons learned from a few HVDC case studies.